This is our first event and we hope to keep this going for the upcoming years. 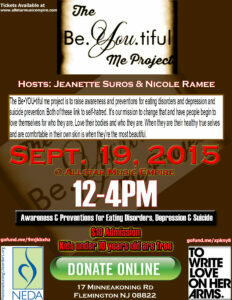 The Be•YOU•tiful me project is to raise awareness and preventions for eating disorders and depression and suicide prevention. Both of these link to self-hatred. It’s our mission to change that and have people begin to love themselves for who they are. Love their bodies and who they are. When they are their healthy true selves and are comfortable in their own skin is when they’re the most beautiful. Our mission to make that happen and for all of us to come together as one and make that change and spread the awareness. To show that it is never too late to get help and the help is there. It’s never too late to start a new chapter. It’s an event for all of us to come together and make the change to self-love and spread it. Half the donations go to The National Eating Disorder Association and the other half goes To Write Love on Her Arms. We want to raise awareness on mental health and how no matter what it is you are struggling from recovery is possible. This is going to be an awesome event don’t miss out! If you cannot make the event but would like to make donations please donate on our go fund me pages. One is for the National Eating Disorder Association and the other is for To Write Love on Her Arms. Nicole: I have been in recovery for my depression. I put myself into treatment for depression and Suicide. I knew about Carrier Clinic through friends of mine who have gone there to get help for addiction as well as mental health. I have been three full years in full recovery. There are good days and there are bad days but that is with any recovery and I know that I will always be in recovery and that goes for anyone else struggling you will always be in recovery and that is okay. But you can take back control of your depression because you are enough. Help is out there and you are NOT weak when you put yourself first and your life before anyone or anything else. Recovery is possible from any mental illness. Jeanette: I have struggled with Anorexia for years. I am a survivor of an eating disorder, Anorexia. I lived my life in and out of eating disorder treatment center Somerset Eating Disorder Unit. I’m now a survivor and I’m so happy to be on the other side. Recovery is possible and the help is there. No one should feel that they need to change who they are! You are perfect the way you are. I have my flaws and imperfections and you know what that’s fine it’s what makes everyone human! The thoughts will always be there but I have the power now to control them and not let them in. Love yourself and love your body for all it does for you. And always remember you are worth so much more than your struggles. You have the power to do anything your heart desires! I want all those out there who feel they are not pretty enough or they are not worth enough and know you are beautiful and you are worth life and happiness! If your struggling from any mental illness recovery is possible and don’t be afraid to ask for help! $10 admission and kids under 10 are free! Tickets will be available online and at the door.